I grew up with DARE and Just Say No. My aunt smoked, and my cousin and I pestered her constantly to quit. The government had told us that smoking was bad for her, and so we hid her cigarettes, or did other devious things all programmed by anti-drug propaganda. That was the extent of my experience with tobacco when I arrived in Amazonian Peru at 28 years old. I had come to work with ayahuasca, and one of the first things our guide did was take us by the Belen marketplace where we bought mapachos, cigarettes rolled with N. rustica, the sacred jungle tobacco. No on could seem to give me a really clear answer on what I was supposed to do with the mapacho. I was left with the vague impression that they could somehow be helpful in ceremony, but beyond that I was unsure. I didn't gain much more clarity that trip, although I did have my first few faltering experiences with this medicine. Over the years, things have slowly unfolded. It's true that when you work with the plants, they will teach you themselves. These days I increasingly experience tobacco as an invaluable ally. This is in such contrast to the way I was raised to relate to tobacco, which has only been called further and further into question since I began working with mapacho. What I haven't experienced with smoking mapacho in intentional ways is any kind of craving for or addictive quality to it. N. rustica is said to be several times more potent in terms of nicotine content than the N. tabacum found in commercial cigarettes, and yet the felt effects seem only mildly notable to me. Thus I am having a difficult time imagining the appeal of smoking cigarettes in the first place while also questioning the narrative around its addictive potential. I am led to conclude that cigarette addiction in our culture must have more to do with cultural construction and/or chemical additives than with the tobacco itself. 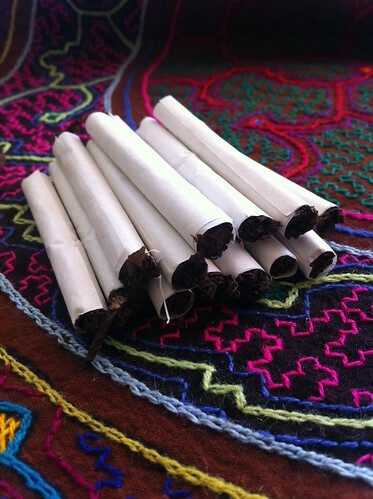 A shamanic understanding of tobacco reveals an additional layer of the addiction dynamic however. It has been said that the tobacco used in commercial cigarette making magnifies the intentions of the corporations making them—and those intentions are to enslave people in addiction for the purpose of profit. Tobacco companies purposely set out to "feed the spirit of addiction in us" and their customers pay them for it. Notice how "quitting smoking" is a construct of our current mainstream reality tunnel. Within a different set of stories, stories in which tobacco is a sacred helper, "smoking" and therefore "quitting smoking" don't even exist as they exist within our culture. Waking up from the mainstream reality into a different relationship with tobacco could prove much easier than "quitting smoking" by obviating the addiction story entirely. Smoking is really hard to give up, i tried several times but failed until electronic cigarette came to the market and now i can say anyone can quit smoking by switching to e-cigs. E cigarettes will be very much beneficial for you if you wants to quite tobacco. Due to e cigarettes doesn’t contains any tobacco they are less harmful. Tobacco addiction is the worst thing which can happen to a person, it gets really difficult as you the dosage of nicotine increases in the body, these days people are finding alternative to give up this habit, electronic cigarettes can really help with this. When we talk about tobacco addiction it is the most difficult thing to quit for a smoker, you can switch to alternatives like electronic cigarette but giving it up completely is almost impossible. Yeah, we actually pay for this dangerous addiction, tobacco is the biggest killer even than it is sold legally.